I have mentioned before how I am addicted to watching cookery videos.I never get bored watching the same videos again and again and was almost thinking to myself that I was a lone person when it came to things like these.I was pleasantly surprised to discover our friends' son,who is only 5 years old,watching 'Show me the curry' and 'Howdini' videos! When our friends come over and he gets bored,he asks for the laptop to watch his favorite train videos.One day he wanted to watch ice-cream videos and somehow we ended up at SMTC's Mango Ice-cream video.He demanded that we make it for him and then hopped on to this Chole video.Then he was pushed aside and me and my friend sat watching it and were delighted to see the recipe,a simple one with few ingredients and looking like just how a 'real' Chole is supposed to be. She tried it the very next day and was over the top with the results,it turned out just like how it was in the video and she has made it a couple of times ever since,every time telling me to try it myself.I don't know why I waited this long to try.It indeed is a keeper recipe. I don't know how an authentic chole tastes,but this one is just like how it is served in restaurants with piping hot Bhatura.Dark brown chickpeas in a slightly tangy and thickish gravy goes perfectly well with roti or phulka as well.As H&A mentioned,it is a wonderful base for making some Aloo Tikki Chaat as well,hmmm. 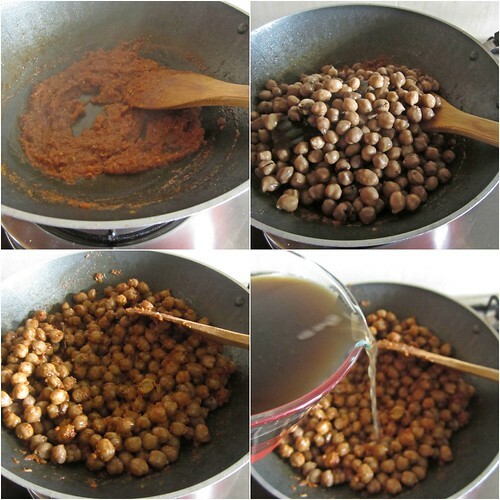 Soak the chickpeas in enough water overnight or at least 6 hours.I discard the water used for soaking and use fresh water after rinsing the pulses.However,SMTC recipe says to cook the pulses in the water in which it was soaked.Use whichever method is convenient. In a pressure cooker,add the soaked channa,enough water to cook it along with the bayleaf,cardamom,cinnamon and tea bags.Add salt to taste. Cook at high pressure for 3-4 whistles and then simmer and cook for 20 minutes. Open the cooker and drain the channa keeping the water aside,which would be used later in the gravy.Discard the tea bags. 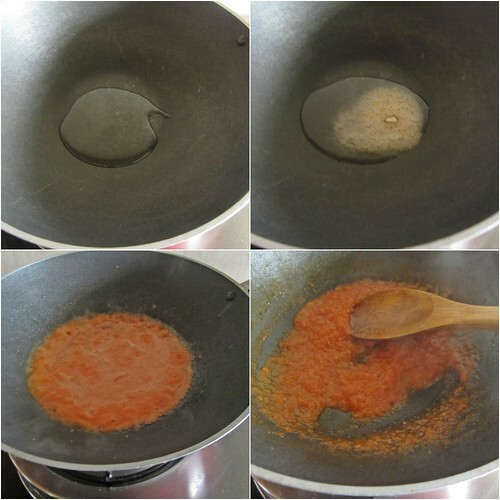 In a thick bottomed kadai add oil and hing.Immediately add the crushed tomatoes and stir.Cover with a lid and cook the tomatoes for about 5-7 minutes or until oil starts appearing on the sides and the puree gets thick. 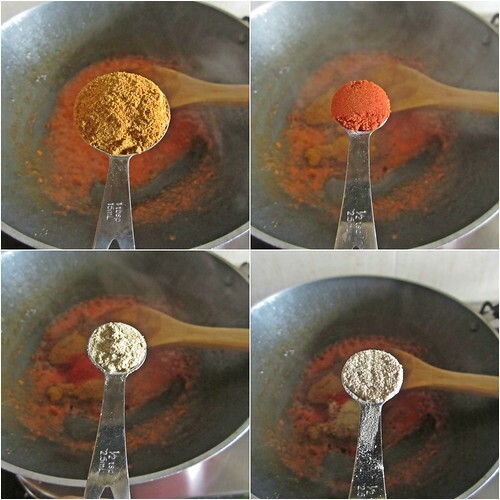 Mix in the dry spice powders - chole masala,red chilly powder,chaat masala,amchoor powder and stir well. Now add the drained chole and mix well.Keep adding the reserved water little by little.Cover and cook.Repeat the process till all of the water is used up.Do not skimp on this step and be patient as the water is absorbed in low heat.This is what gives a rich,concentrated flavour to the dish. 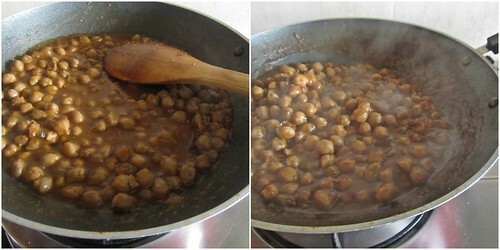 Switch off the flame when the gravy is a bit thickish.The channa will keep absorbing it as it cools down. Garnish with freshly chopped coriander leaves and sliced green chilly and onions. Off this goes to Siri who is hosting My legume love affair this month,an event conceptualized by Susan and taken forward by Lisa. Delicious and mouthwatering looking chole. Best to have for breakfast. Chole masala looks delicious, perfect with some batura. 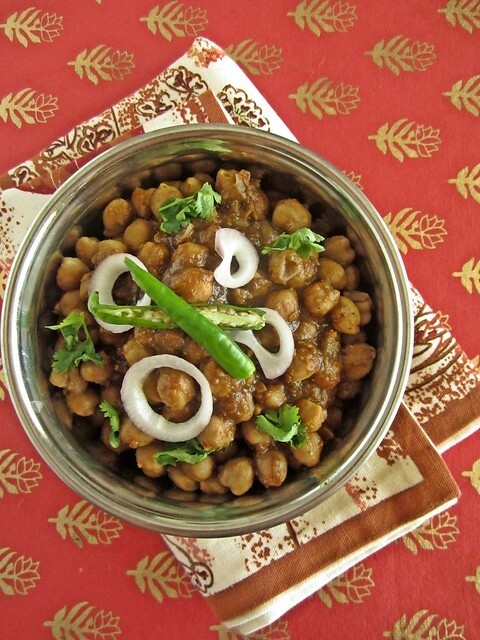 yummy chole with lovely clicks. i like your measuring spoon much :D good one ! Looks delicious. I'm going to try it tomorrow. By the way,which tea bag did u use? Looks delicious. I'm going to try it tomorrow. Can u tell me the name of the tea bag used?? 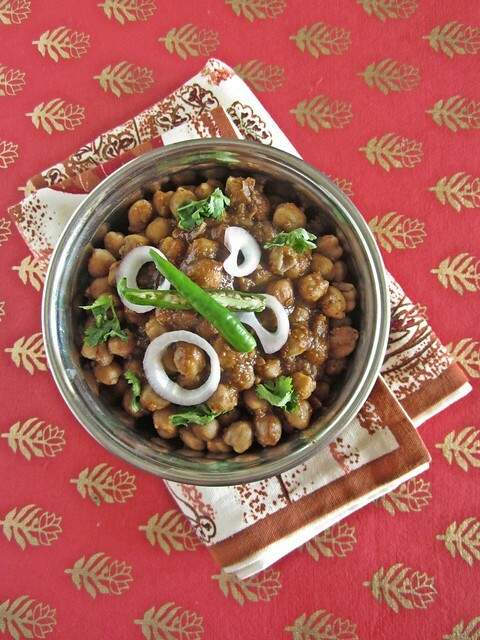 I love punjabi chole for its burst of flavours....looks very tempting! Chole and bhatura, killing combo, never get bored of them. 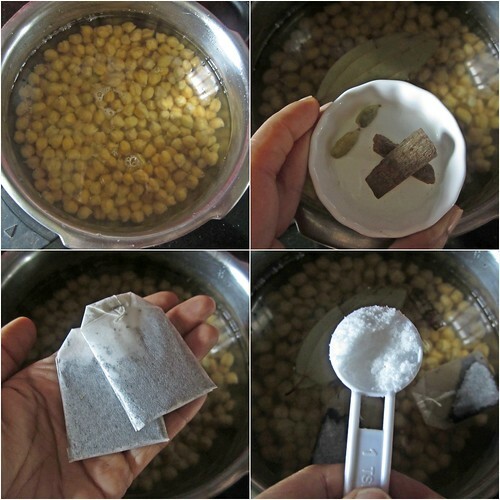 Love the idea of using tea bags. Haven't seen this before.